When your friend gets married, you get a certain perspective on life. You think about the enormity of making a life-long commitment to another person. You think about the beauty that surrounds their special day. And, if you’re anything like us techy, entrepreneurial types where when our friend Yossi got married, you think about what you can do to streamline the delivery of photography services, to make the sharing of photos and video simpler and more efficient. As we contemplated this complex and critical issue, we decided that we needed a single digital media and photo sharing platform that allows photographers to collaborate more effectively with their business partners, like designers and print labs, and to share their work with their clients quickly and easily. Two years down the line, Yossi and Nora are still blissfully happy. Meanwhile, LyncPix has enhanced the weddings of over 36,000 couples /OR/ been a crucial part of over 36,000 events so far, and we’re now launching the third generation of our platform. Can I trust LyncPix cloud services? LyncPix cloud storage services are based on the latest S3 Amazon technology – a secure, resilient, redundant, off-site storage solution where all of your digital media and projects are kept safe and sound, while being available to you at any time! You can use LyncPix as your permanent backup solution, or you can upload and remove projects as needed. It’s totally up to you! Do my images get resized when I upload them? Original high resolution image of the file that you upload. Reduced file size – for print labs, our innovative algorithm reduces the file size by an average of 6x, without damaging the file quality and DPI. Either way, LyncPix will keep your files and project stored on our cloud, making it a great backup solution should you ever need to access your images in their original size. What makes LyncPix different from other file delivery software? 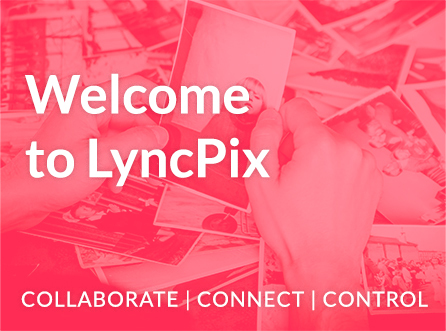 LyncPix was created because there just wasn’t an efficient and smart tool out there, specifically for photographers, which allowed them to quickly send images while still keeping the entire brand experience visible to their clients. LyncPix is the ideal solution – fast, flexible, and completely tailored to a photographer’s business. When I send photos via LyncPix, how quickly do they arrive? With LyncPix you can send and share any number of images of any size to anyone in less than one minute. What size images can I share and send from LyncPix? Sharing and sending your photos/images is very simple. There is no need to configure or set sizes – the LyncPix algorithm does this for you based on the end user device. If you want, your photos can have your watermark and/or link to your business Facebook page or website stamped on them– we’ll do all the behind-the-scenes preparations for you! Can I install and work with LyncPix on more than one computer? Not only is this possible, but it is recommended that you do! One of the key features of LyncPix is accessibility – wherever you may be, whatever time of day or night, we want you to be able to log in from your computer or mobile device and access your LyncPix account so that you never need to miss an opportunity to send photographs to your existing or potential clients. Can I try LyncPix before I sign up? Yes! We have a 30-day free trial, with an option to extend it to 45 days, that will allow you to get a taste for all the benefits and advantages that LyncPix has to offer. During this period, you can fully manage your studio, events, projects, create your own branded mobile app and even set up your own e-store. How do I choose the price plan that is right for me? First it’s good to know that you can upgrade or downgrade your account at any time for no charge, so if your circumstances change or you change your mind, you’re not stuck with an option you no longer want. We recommend starting with the monthly plan – this way, you don’t get stuck in a yearly cycle if you need to modify the plan. Also, don’t pick the unlimited option right from the start – if you do come close to exceeding your storage limits you can be sure that LyncPix will inform you well in advance. It is always possible to upgrade your plan and we’ll credit you with any existing funds. Can I pay for my plan in installments or must I pay for it up front? This is up to you! Both options are available, but if you do pre-pay for a year of storage, you’ll save a little extra on the annual fee. Do I need to buy any software in order to use LyncPix? Not at all! LyncPix is a web browser plugin application which you can install free of charge on your Mac or PC. Once you’ve installed it, you can manage and share your images using any browser, any time you like, wherever you may be. LyncPix offers a selection of monthly plans to satisfy different needs and budgets. Simply join the plan that best suits your business and,whichever you choose, you will be able to enjoy the LyncPix features. Will I be charged each time I upload my images to LyncPix? Hopefully you’re really busy covering loads of events – it would get expensive if we charged you for each one you uploaded! That’s why with LyncPix you pay for the amount of storage that you rather than the number of events you upload. You can learn more about our price plans by clicking here. Who prints my LyncPix orders? We have selected print labs with the best reputation and fastest turnaround times to work with. There are several in our network, and you can search for them based on your location. Find out more about them here. Who manages tax payments on sales? When you set up your e-store, you will be asked to select your applicable country and regional tax rates. You are responsible for collecting and paying all federal and state taxes on any prints/products that you sell. What if I want to fulfill and ship print orders myself – can I? You can usually do this – just make the necessary arrangements with the print lab you work with. I have a question about a print order. Who do I contact? You can contact the print lab or LyncPix support team with any questions you have about an order. Use the chat bubble inside the app to talk to us directly. In which countries can I sell prints/products with LyncPix? We have a growing list of countries that we work with. To join LyncPix, you must have a business and bank account in the country where your customer is based. Can I create different price sheets and discount codes for different clients? Absolutely! You can create your store products and pricing catalogs in whatever way you like, and control which prints and products are available to each client. You can also create a custom discount for a specific gallery. How do I get paid for all of my sales through LyncPix? Once your order has been shipped, the money is released automatically to your bank account and should be visible within two business days. Does LyncPix takes any commission on my print sales? Absolutely not! You get 100% of the proceeds from any sales you make through LyncPix – even if you’re using a free plan! Do you notify me when my orders have shipped? You can track the status of any order within your LyncPix admin panel. Can my clients access their galleries and my e-store from any device? Yes! Your clients can access their online gallery for viewing, sharing, and ordering photos from any mobile device. How do my clients download their photos? We allow you to share your with your client their original files with the click of a button. When you create an online gallery for an event you can enable or disable downloads and determine exactly what size image your clients can download. If you allow them to, your clients will be able to download all their photos with just one click! A download link will be sent to them from your business, inviting them to download all of their photos. It’s as simple as that! Where can I learn more about LyncPix client galleries? Have read of our Knowledge Base to find out what you can do with your client galleries! Do my clients have to create their own account with LyncPix to view, share and order their favorite pictures? No! LyncPix provides your client with a user name and password so that they, and only they, may access their private area. Once they have proofed, shared and ordered their favorite photos, you can see their choices from the LyncPix admin panel. How secure is my client’s online gallery? Security and privacy protection is a top priority for LyncPix. You can set passwords and gallery expiration dates to limit access to images. Does LyncPix have a Home Page for viewing all of my LyncPix galleries? Yes! LyncPix enables you to have an online gallery for every customer and every event, and to organize your products into customized categories. What protection do I have from unauthorized use of images? We believe that only you should be allowed to profit from your work. You can have your gallery images watermarked when your clients view or download their images, and control the download size permissions so that full size images are only available through you. You can modify these settings at any time. Can I customize my mobile app? Yes – indeed this is one of the unique and exciting features that LyncPix offers! When you create an account with LyncPix we customize our mobile app to incorporate your branding. Your galleries, portfolio, Youtube and Vimeo channels can all be synched to your branded mobile application so that yours is the only name your clients will see! To further customize your online galleries and branded mobile app, you can select a theme that will be applied to various icons, buttons, and elements of your mobile app. How can my clients download my branded mobile app? Your app will be available for download in Google Play and the Apple App store. Save precious time typing the same proposals over and over again. We enable you to define and design multiple proposals based on your product and services, logo and customized text! You can even quickly edit the text of a template quickly and easily, just before you send it out! Where will my clients be able to see my brand and logo? Your logo will be seen on your admin panel home page, your online galleries, and on all proposals you send out from LyncPix. How can I encourage my clients to visit my social media pages like Facebook? With LyncPix, it’s easy! Every time your clients publish one of your images to Facebook, WhatsApp, Instagram or any other social media channel, your brand, name, watermark and link to your own Facebook business page or website will appear. We also include icons and links to your social media pages on any email or proposal that you send out via the LyncPix admin panel. Can I create my own watermark? How? The beauty of LyncPix is that it’s all about you and your branding. That’s why we have made it possible for you to completely customize the look and feel of your watermark, quickly and easily, through the LyncPix admin panel.